Even if your thumb is less than green, greenhouses provide an opportunity to grow vegetables and/or flowers no matter what the season. The greenhouse effect maximizes the use of sunlight and keeping heat within the enclosed space— think of your car interior on a sunny day. That greenhouse effect works no matter what the scale, so anyone can extend their growing season no matter how large or small your greenhouse is. 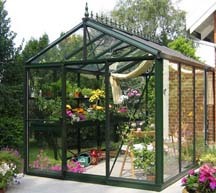 A key choice to make when choosing a greenhouse is selecting the glazing material or clear covering that will allow the sunlight into the greenhouse. Choices range from plastic sheeting, which needs to be replaced once every two to three years; clear PVC sheets, which are rigid and inexpensive but also have a tendency to yellow over time and glass, which provides the optimal transmission of light into the greenhouse interior. With many models available on the market, we’ve highlighted a few interesting greenhouse options. For the starter greenhouse under $800, you may want to consider the sturdy Little Greenhouse kit (left) which uses thermal polyethylene film, which unlike barrier film used in home construction, is thicker and UV treated for greenhouse use. You’ll need to add a small amount of wood to the kit materials to construct a base and secure the plastic sheeting, but the kit also includes a hinged door, bench materials and a three-speed exhaust fan, essential for keeping a constant temperature and humidity. For an intermediate gardener who wants more structure for the greenhouse, you’ll want to check out the hobbyist kits from International Greenhouse Company which feature various aluminum frame configurations, and rigid polycarbonate panels. IGC also has Victorian-style glass greenhouse kits which feature cast aluminum finals along the ridgeline and easy, snap together construction. If you’ve decided that a greenhouse gazebo will add an architectural dimension to your home, the construction will be more involved. You’ll want to start out with a solid foundation, just like any permanent structure you build. Pour concrete footings at a depth appropriate for your climate (a minimum of four inches above and below the surface) and fasten the baseplate of the greenhouse to the footings with bolts. To keep the floor permeable and allow water to drain away, lay down some landscape fabric over the soil and cover with a layer of mulch. Multilevel benches and circulating and/or exhaust fans, depending on your climate, help to keep plants healthy and disease resistant. 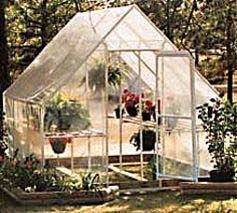 Large or small, greenhouses can add an exciting new element and allow you to enjoy fresh herbs, vegetables and flowers year-round.